It is just as hot! You change money in banks! It was a much more shady business when we were here in the mid to late 80s. The taxi driver was comparing the time when we were here, with Zambia now, and his main point was that now it is much easier to do business. Although Kenneth Kaunda was a well loved leader, he was, he said, at the end of the day, a dictator. “If you wanted to build a house then you had to prove where you got the money from. Now, you can just do it.” He had two houses which he had built and he rents them out. And finally and most significantly, the mobile phone has arrived. 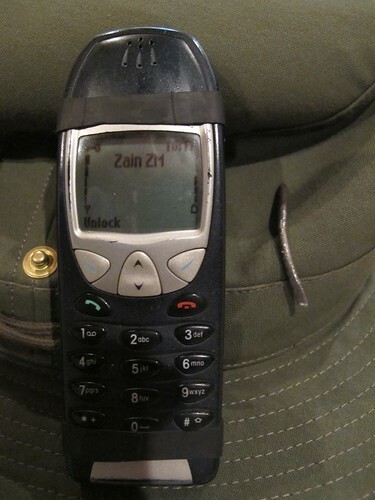 I grabbed an old Nokia phone from home as I left and within a couple of hours of arrival here, I’d bought and SIM Card (K5,000) and K50,000 of air time and I’m now part of the ‘African Mobile Phone’ phenomenon. I’ve got a cool number too: 09796 73631 (+260 9796 73631)! The phone itself is very old (note the bits of inner tube holding the battery on!). But it works fine. Old friends of ours in Zambia have lent us their house while we are here (and they are in Australia!) so we are very comfortable. They have also lent us their car which is amazing. We used to the car to go the shops (where I got the SIM). When we came out, having done some food shopping, we found that the car had a flat tyre! Luckily we were within 50 metres of a filling station which had ‘free air’ which was working. As I pumped the tyre up and thinking what to do next, I looked over my shoulder to see “Ody’s Tyre Services” so within an hour we were back on the road. It was the nail in the picture that caused the puncture. All this excitement did mean that I was late for my appointment at Hodi to look a the room for the workshop next week (Wednesday, 20 Oct) but I got there in the end. The room is very basic and very hot but will be fine with a couple of fans and ad lib water! We are hiring some chairs and buying in lunch and I went across the road and bought flip chart paper, pens and masking tape so that is the logistics sorted for the workshop. Finally, in the research we did before coming, we came across a video on SODIS made by the Keepers Association of Zambia. Unfortunately, I could not find contact details for them. Well, their head quarters is four houses down from where we are staying! We popped in this morning and now have an appointment to meet with them at 9am on Thursday. So, all in all, quite a productive and enjoyable day. And finally, finally, it’s tree blossom time of year and the Jacaranda’s are amazing, so I’ll leave you with this picture taken from the taxi from the airport. Not brilliant but you’ll get the idea. You can read the whole of the Zambian Diary here. And the audio diary is here. Melinda Gates on non-profits learning from Coke! 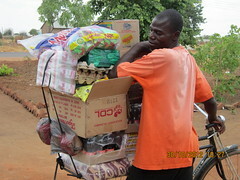 Following Simon and Jane Berry's @colalife Zambia diary Day 1 https://j.mp/9XW2yf . What a story. What stars. 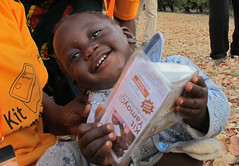 RT @davidwilcox: Following Simon and Jane Berry's @colalife Zambia diary Day 1 https://j.mp/9XW2yf . What a story. What stars.